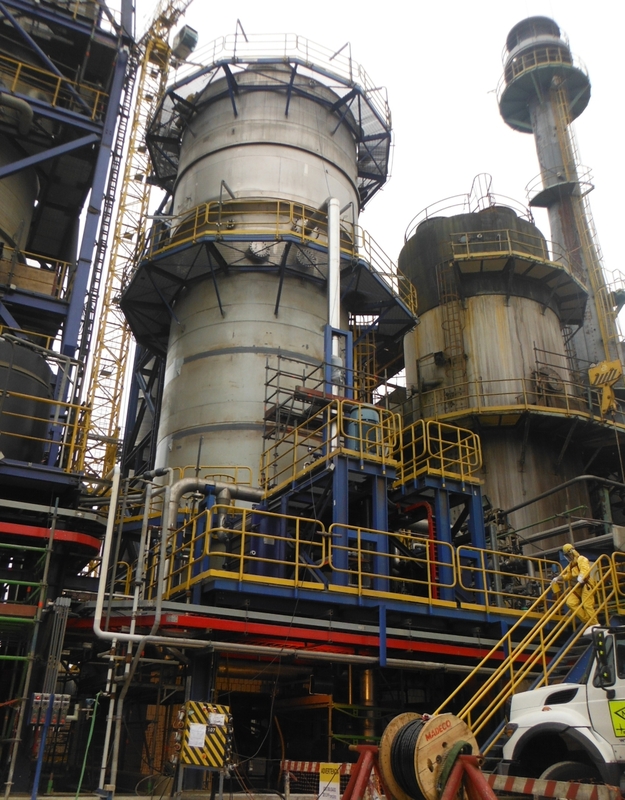 New Acid Tower for Chile – NORAM Engineering and Constructors Ltd.
An extensive upgrade of a sulphuric acid plant for a Chilean copper smelter included the supply of a new NORAM brick-lined final acid tower. The 1,300 MTPD double-absorption plant treats off-gas from Teniente and Peirce Smith converters. The acid tower, capable of increased gas throughput and a lower pressure drop, allows treatment of up to 150,000 Nm3/h of metallurgical gases, to capture essentially all SO3 gas and to produce commercial H2SO4 of 98.5% purity. Environmental performance of the plant improved significantly, with a greater than 95% reduction of SO3 and acid mist emissions. NORAM provided basic design, detailed engineering, site services, fabrication advisory services, and start-up assistance. Specialised equipment, including some tower internals, and acid distributors, was custom manufactured in BC for shipment to site.